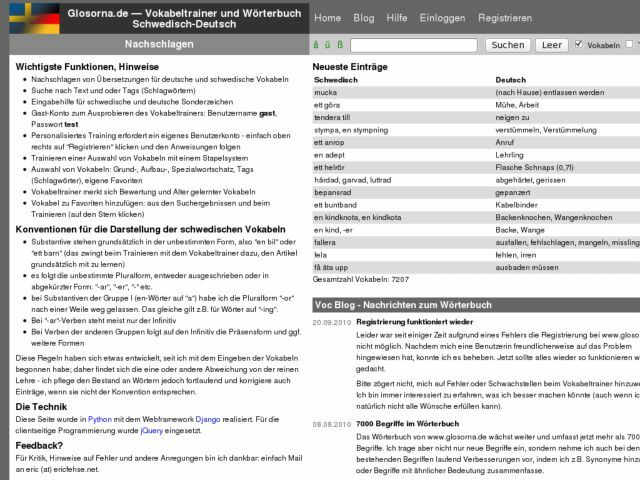 A Swedish-German vocabulary training and dictionary application. The dictionary currently contains about 6000 [HTML_REMOVED]training cards[HTML_REMOVED], but I[HTML_REMOVED]m regularly adding more. When the user starts a vocabulary training, they can choose from three levels: basic, advanced and special vocabulary. The selection of words to be trained can be refined by selecting one or more tags (like [HTML_REMOVED]work[HTML_REMOVED], [HTML_REMOVED]finance[HTML_REMOVED], [HTML_REMOVED]nature[HTML_REMOVED], ...). During training, a score is assigned to each of the vocabulary cards based on how well they were reproduced. This can be used in future learning sessions to concentrate on [HTML_REMOVED]harder[HTML_REMOVED] entries that have lower scores. Alternatively, the user can choose to train the [HTML_REMOVED]oldest[HTML_REMOVED] entries of a given level or tag combination. Dictionary lookups can be done anonymously. Users interested in the vocabulary training application should register an account, but there[HTML_REMOVED]s also a guest account to try out the training app.